Sorry, it’s been too long since I posted a recipe, but I’ve been getting back into the school routine! Lately, I’ve been reaching for my tried and true friend, the crock pot. So many times in the last month it’s been a real dinner saver! 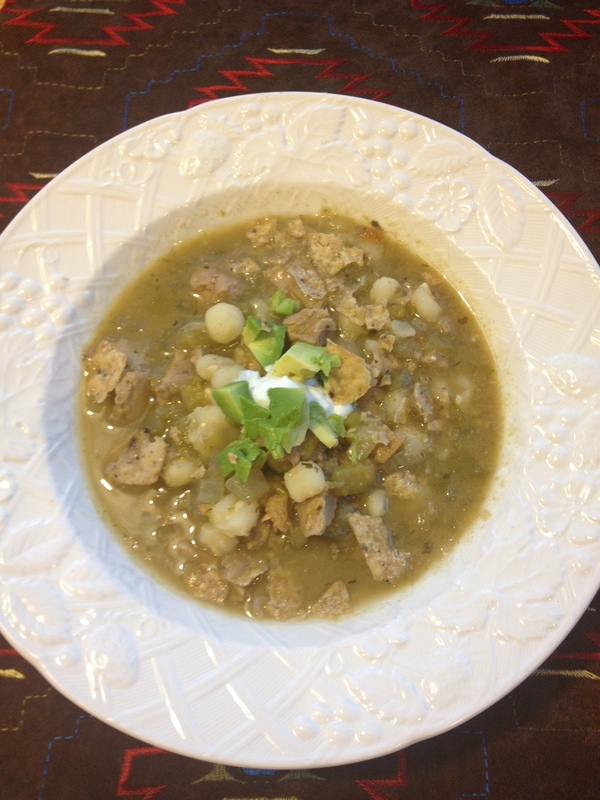 Last nights Green Chile Pork Posole was so yummy and quick and what a wonderful greeting to come home to after a late afternoon soccer game. What is a “posole” you ask? It’s simply a Mexican-style soup, traditionally made with pork and hominy. It does have a little “kick” to it…but the condiments I used to top it can mellow it out a bit. Give this one a try, I think you’ll really like it. 3. Serve with the yummy toppings. Try the plain, fat-free greek yogurt in place of sour cream. It’s tastes the same and is better for you! Posted in Crock Pot and tagged Broth, Chile, Chili pepper, Cook, Mexican cuisine, Pork, Pork tenderloin, Slow cooker. Bookmark the permalink. I just got this going in the crock pot and can’t wait until dinner! This is the third time I’ve made this posole, and the last two times I’ve added 1/2 can of rinsed black beans. We LOVE the flavor the salsa verde gives and enjoy using pork for this soup. Thank you Linda! I’m so glad you enjoyed! Great idea on the black bean addition, i love new variations! I just left a comment on Peggy’s Green Chile Salsa & Pork Stew on lespetitesgourmettes.com that recommended your delicious posole as a similar dish. You would probably enjoy their stew that uses Hatch Valley Salsa from TJ’s. I know that anyone who tries your posole will LOVE it like we do.